Thank you, Tracy, for doing this for Laurel and Patrick... I know it will mean a lot to her as she and Patrick are on their difficult journey. Love you. I'm so sorry that they have to go through this, they'll be in my thoughts and prayers and will be sure to follow her blog! I will send all the good thoughts I can for the Tracy..
what a sad story :( I cant imagine. Their family will be in my thoughts and prayers. I will follow her blog. It is so sweet of you to spread the word about this, Tracy! I will absolutely be praying for Laurel and Patrick, and everyone connected in their lives. I truly do believe miracles are possible, and I will be hoping for one for this family. Oh goodness that's awful. I'll be sure to keep them in my prayers. Oh my gosh! What a horrible situation to be dealing with! They are both in my thoughts and prayers! Thanks for sharing--you are right about the blogging world--it amazes me! Many Many thoughts and prayers to them. I so dislike cancer and continue to hope one the the miraculous cure will come. I dont think people should have to go through such a battle. Wow -- I can't imagine what she's going through. Her and her family will be in my thoughts and prayers. Thank you for sharing! We will be praying for this sweet family. wow, i will most certainly be thinking about them and praying for them!! such a scary thing, but hoping God will work a miracle and they will get thorugh this difficult time in life--stay strong friend!! That is heartbreaking. I am so sorry they have to go through this. 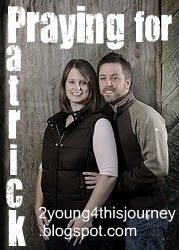 Praying for their beautiful family and for Patrick's health. this breaks my heart. Praying for them! i stopped by and they are both so strong. thank you for sharing their story with us, love. Thanks for sharing Tracy. I am now following her blog. Wow...I can't imagine what they must be going through. I will be praying for them! I'm new to the blogging world but wanted to let you know that my father was diagnosed 10 years ago with Stage 4 Lung Cancer and he's still alive and fighting today. There are so many treatment options and if one doesn't work, there are always others to try. Tell him to keep a fighting spirit and he will get through it. My thoughts and prayers are with you and your family. I can certainly relate. My kids are the same age as hers. My husband doesn't have cancer (not that we know of) but has been going from medical test to medical test for the past few months. We're hoping to get a real answer soon. he had a biopsy today. Good for you for getting this out there for her. Praying for her family and yours.